Hi, everyone! It's Gary from Ontario Motor Sales. With the launch of the all-new 2016 Chevrolet Malibu, I wanted to take a step back and consider how far we've come with the Malibu line. It's a model that has been around for a long time, and is central to the Chevrolet brand. 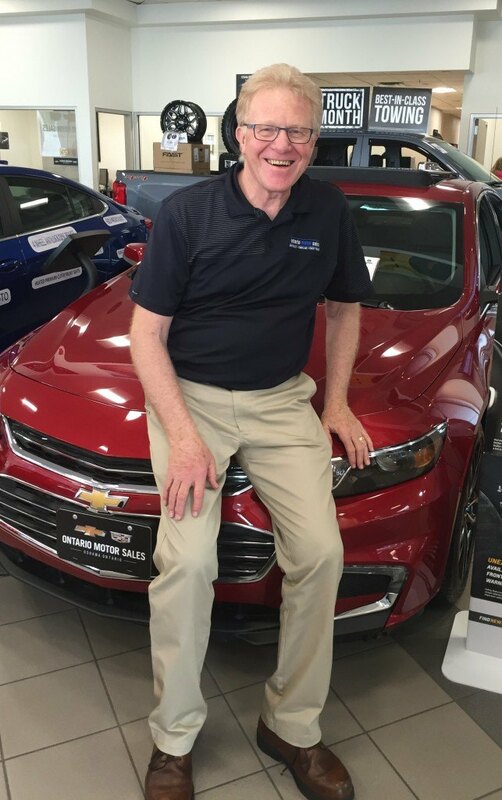 I will get into the ways that the Malibu, Ontario Motor Sales, and the car business more generally have changed since I began working here in 1973. Our team has done some research and together, we have found some exciting and funny things we'd love to share with you. I hope you'll enjoy reading this article as much as we enjoyed putting it together! When I started working at OMS in 1973, I actually began by working in the daily rentals department—something most dealerships don't have these days. Soon after, I transitioned to the sales department, and have enjoyed selling new and pre-owned vehicles at OMS for 40+ years ever since. One of my favourite Chevrolet vehicles, and certainly one of the most significant, is the Malibu. Having just been redesigned, the new 2016 Malibu is state-of-the-art, and during my training with the newest iteration, I've been thinking back to the Malibus from my earlier years of selling cars. In 1973, customers considered air conditioning and in-dash 8-track players as trendy options! 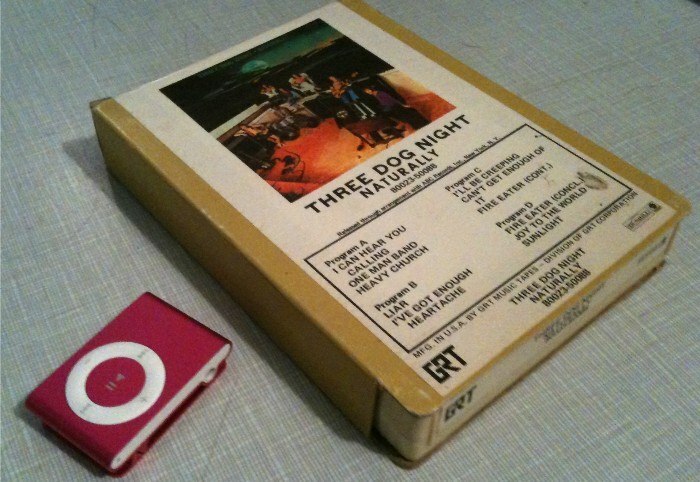 Here's a picture of an 8-track tape beside an iPod, to give you a sense of their size. Now we've moved past cassette tapes and CDs, and the way people play music in their vehicles today is often through XM radio, a USB port, or Bluetooth from their phones. It's also interesting to think about how safety has changed since those days. 1973 Malibus came with across-waist seat belts with no option for shoulder straps. When shoulder straps came out a few years later, you had to latch them on yourself. Now, you can't buy any vehicle without complete seat belts! Other options in the 1973 Malibu included an analog clock, power brakes, and tilt steering, but none of those came standard. It's possible that we take for granted a lot of the safety features and other luxury options that are now available in new vehicles. For example, each 2016 Malibu comes standard with 10 airbags—something Chevrolet is including in as many of their vehicles as possible. The new Malibu also comes with optional Blindzone Alert, Lane-Keep Assist, Rear Cross Traffic Alert, and several other modern safety systems. Below is a comparison picture to give you a sense of the interior differences between the 1973 and 2016 Malibus. I think the demographic of many of our customers has changed since then too. 1973 Malibus came with a V8 engine that advertised 350 horsepower. Today, most people are more concerned about fuel economy than pure speed, and so the 2016 Malibu Premier runs a four-cylinder engine with 250 horsepower. It would be personal preference to consider which is better, but it's an interesting change to think about! One thing I don't think I could live without in my vehicle today is its power-adjustable seat. Believe it or not, the 1973 Malibu had a power seat as an option, but it was pretty expensive; it could be added for $103, which is the equivalent to well over $500 in 2016 figures. Things have sure changed: Bond Street and King Street aren't two-way roads anymore, our cars are safer than ever, and computers now play a huge role both in my job and in the lives of our customers. At the end of the day though, I still love selling cars. Seeing how this industry has changed over the last four decades has been very exciting. It's a dynamic business and looking back as I've done today helps us to appreciate where we've come and can maybe get us thinking about where we're headed. Thanks for reading! If you'd like to get in touch with me to discuss Malibus, OMS's history, or anything else, feel free to email me at gdionne@ontariomotorsales.com. Take care!